Ah, the mid ’90s. I didn’t truly appreciate it at the time, but Score and Collector’s Choice were the last remaining large sets attempting to maintain something of a classic approach to card design. The border frames and full-color, glossed backs were definitely modern, but when you compared them to the other sets of the time (as well as all their successors), the intent behind the sets was such that if they were produced today they would almost be considered retro. I would personally love it if Topps or any of the partially-licensed companies produced a similar set that kept the parallels and inserts to a minimum. 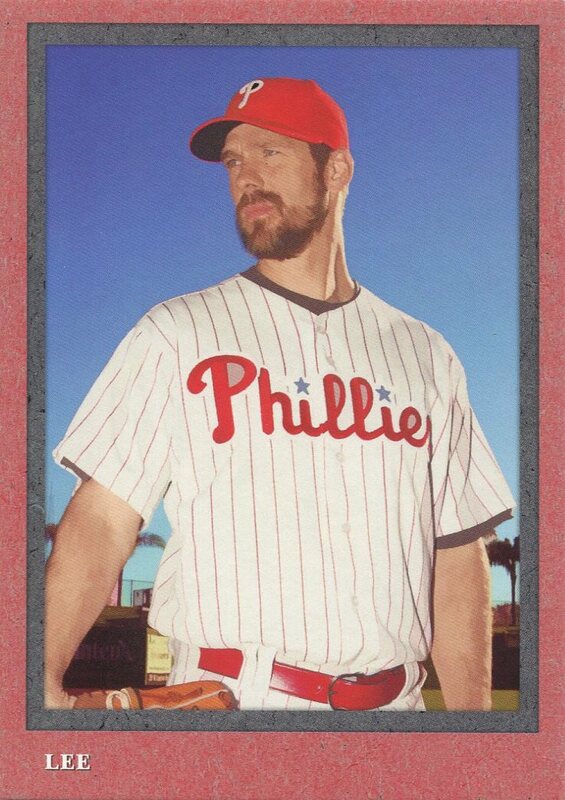 Don’t tell me that Topps Opening Day fulfills this role. It doesn’t count because it’s, in essence, just a partial parallel of the regular Topps set. 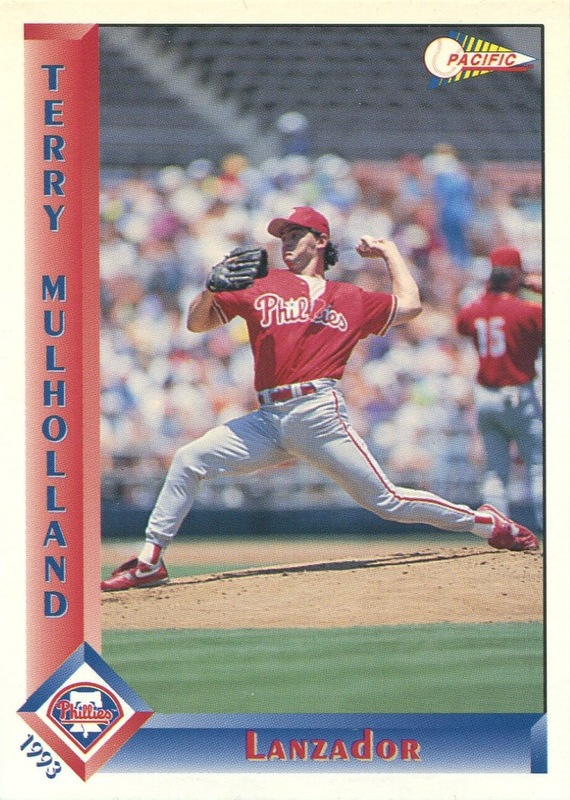 1993: The Last Great Year for Basic Baseball Cards? 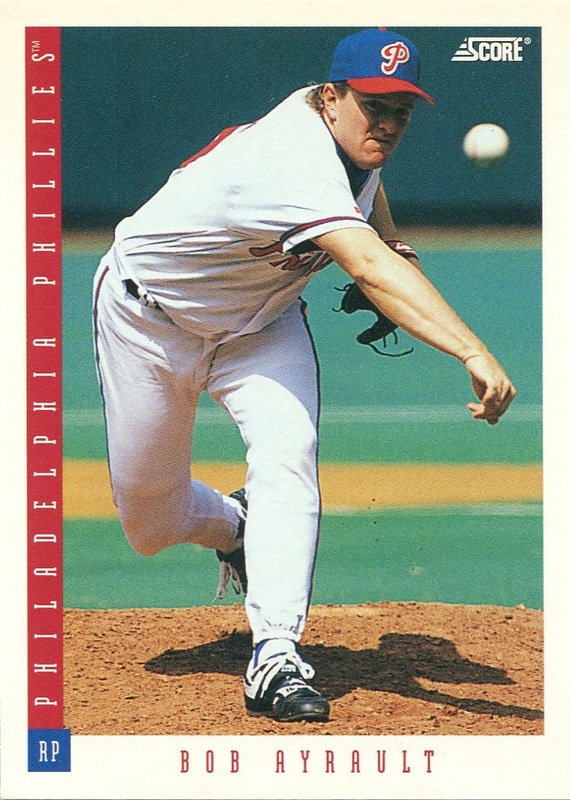 I’m going to sound like something of a curmudgeon, but I’ll just put it right out in front: 1993 was the last great year for basic baseball card design (and no, this has nothing to do with the ’93 Phillies). This is a huge deal because by 1993, I was 21 years old and these were not the sets of my youth — the type for which a significant percentage of collectors feel the most nostalgia. 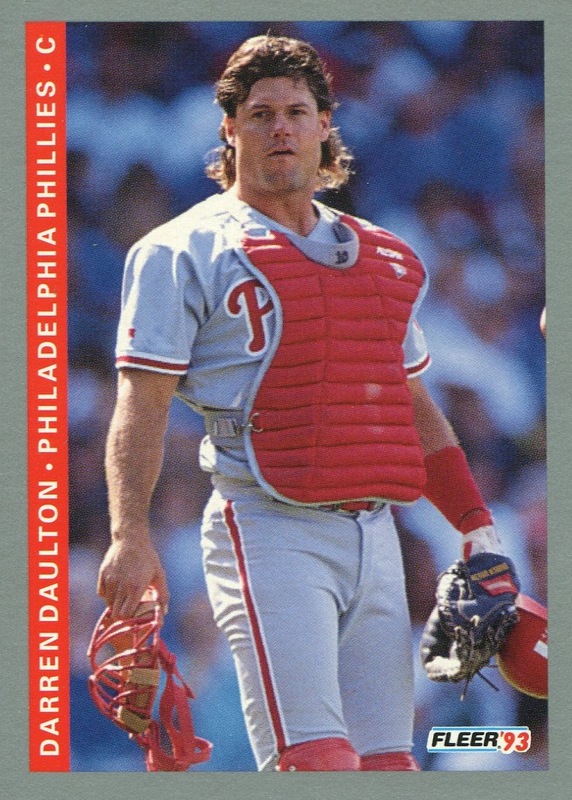 By then, I shifted all of my collecting efforts into assembling a Phillies-only collection, and outside of those acquisitions I saw very little else. In fact, back when these cards appeared in ’93 I don’t think I was thinking that much at all about the design of those cards in comparison to what came before and after. However, this part summer an old friend gave me his baseball card collection, which was overwhelmingly comprised of ’90s and early ’00s issues. As I sorted through and cataloged them, I gained a whole new appreciation for the 1993 Donruss, Fleer, Score, Topps and Upper Deck base sets. The overriding reason was simple: collectively, they were the last gasp of the basic baseball card design as we knew it. That was the last year we saw a large array of clean, traditional borders, no foil stamping or special finishes (other than a basic gloss applied to both the front and the back), very few parallels, and sets large enough to portray the entire starting lineup, starting rotation, and a handful of relievers & reserves. It also simultaneously, somewhat paradoxically, marked the first time that all the major manufacturers, in unison, finally designed proper full-color backs. Not all the sets were good ones — there were certainly a couple designs that were lacking. However, as a group, they did provided a strong presentation of card design before full-bleed photos, high-gloss, foil stamping, foil printing, oodles of parallels and SPs went rampant throughout the hobby. Here’s a quick review of the base sets that year. Simple design on the front, but it’s the back that made this a wonderful departure for Donruss. 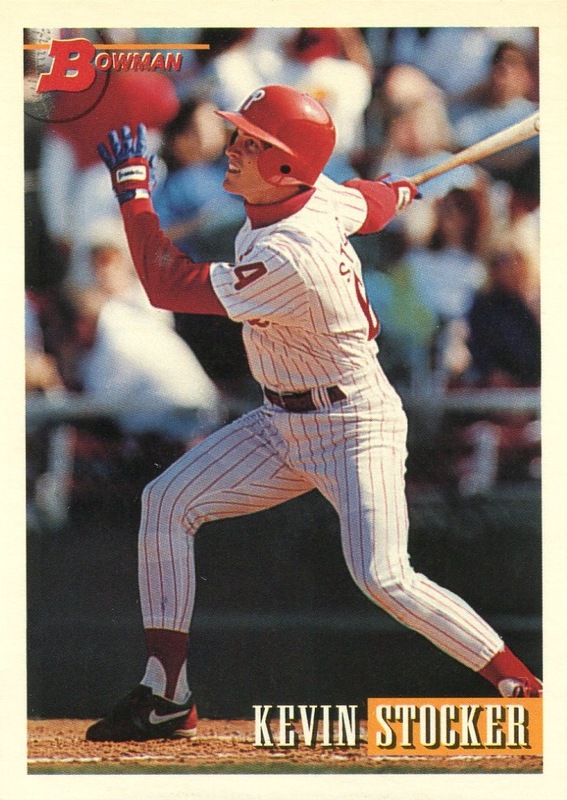 Donruss went full color on the backs in 1992, but despite the addition of a portrait photo, the backs were still basically recognizable as a variation on the ones Donruss produced for the previous 10 years. 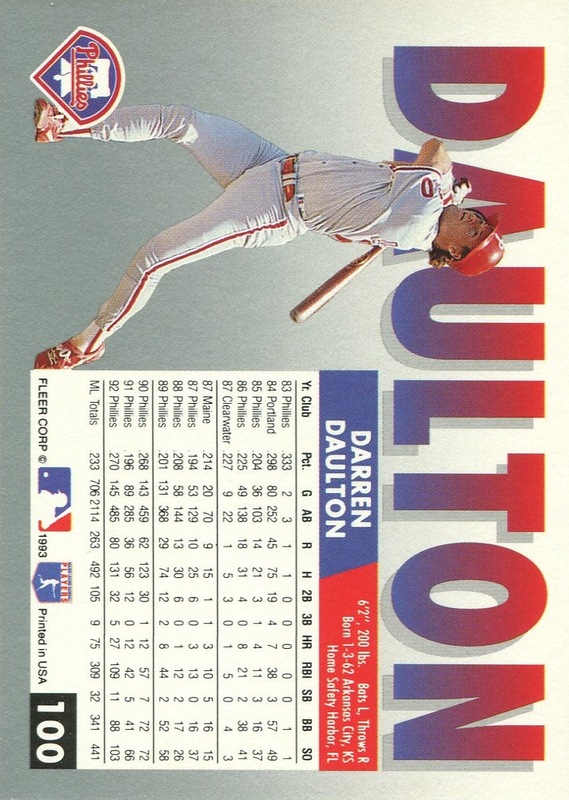 However, back of the ’93 sets was a real change for Donruss. True, they still only gave five years of stats, but the portrait layout and larger photo represented the first truly new Donruss backside layout since the 1982 set. Unfortunately (from a traditional perspective), this set was also the last time that Donruss would issue base cards using traditional borders of any color until 2001. 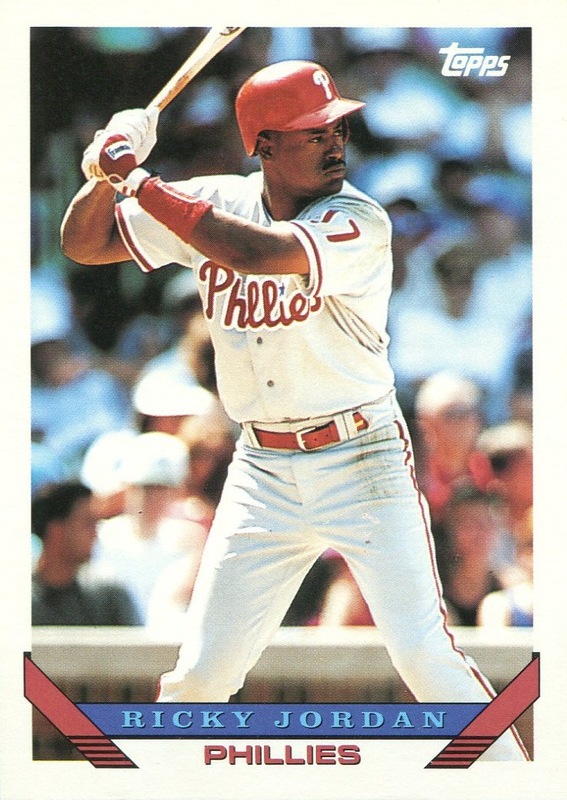 Fleer embraced proper, full-color backs in ’91, and it’s ’92 set was actually better than this one. The gray borders make the set look somewhat dingy, and I really would’ve loved to see what they would have looked like with white borders and a simple, thin black frame around the photo and the team name/player/position line. 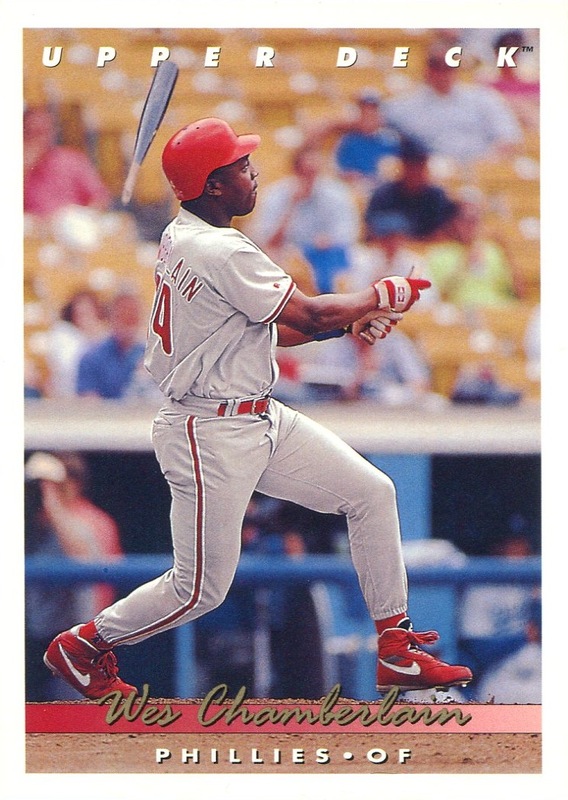 However, like Donruss, Fleer kept the design simple and clean, and while the poster-like font and presentation on the back of the card bordered on overkill, they did a nice job of incorporating an action photo onto the back of the card. In ’94 Fleer would produce arguably their best set ever, but some tasteful, judicious foil stamping placed it outside the realm of traditional design, and they wouldn’t release a traditional-style set again until the release of 2000 Fleer Tradition. 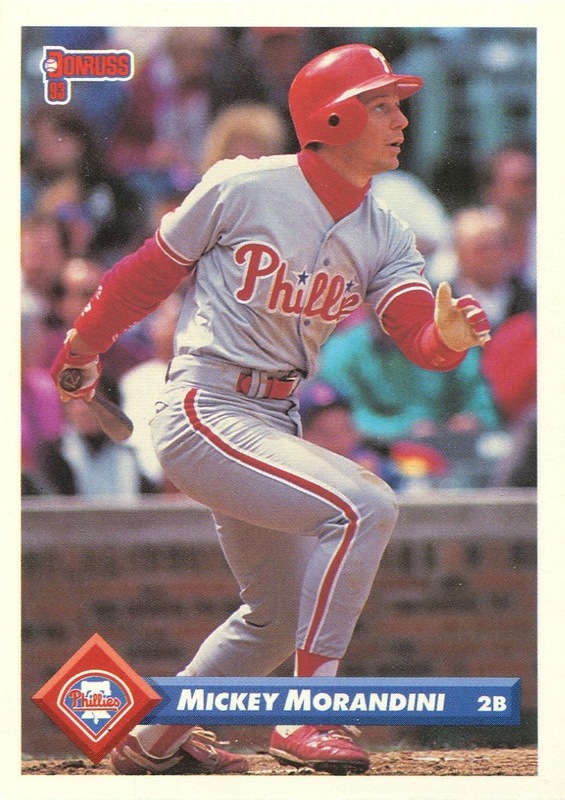 Although all the major base sets employed a very simple design, this set was almost certainly the least inspired and most boring of the major base sets in ’93 (the very stolid font used on the front of the card certainly didn’t help). Score was at the forefront of full-color backs bearing pictures back in ’88 and as was the case with Fleer, their massive, 893-card ’92 set was actually much better. In fact, the only Score set worse than this one is the 1990 issue. To their credit, despite embracing parallels and modern card design elements in their other offerings, the Score flagship set continued to employ solely traditionally design elements right up through the demise of the company in 1998. 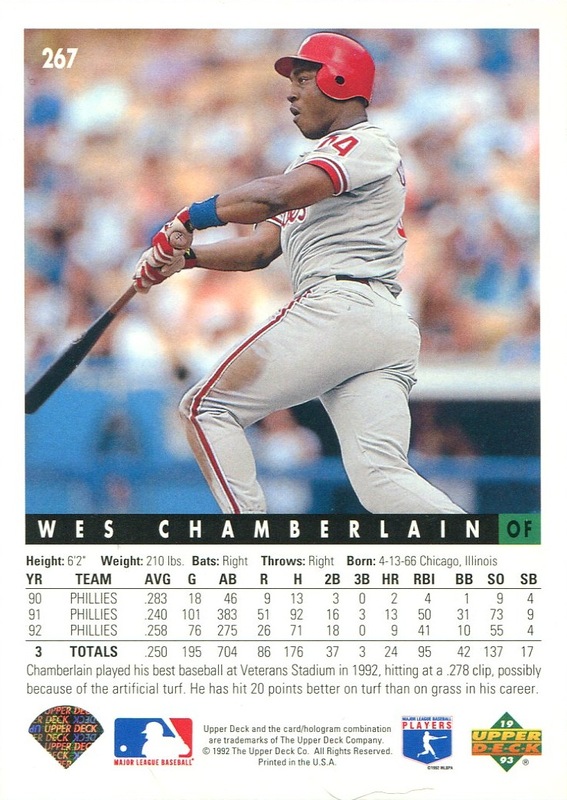 Although Topps finally issued cards bearing full-color backs in ’92, it was really done half-assed. The backs did not contain pictures of the players, and Topps did not apply any kind of gloss finish to the backs. That changed with its ’93 release. However, the design of the card was somewhat schizophrenic; the relatively simple front design (which inexplicably did not include the player’s position) was offset by a much-busier back design that doesn’t readily appear to use any of the same design elements. Nonetheless, the total effect made it one of the better Topps flagship issues of the decade. Sadly, the ’94 set marked the last time Topps did not make use of foil stamping on the base set. 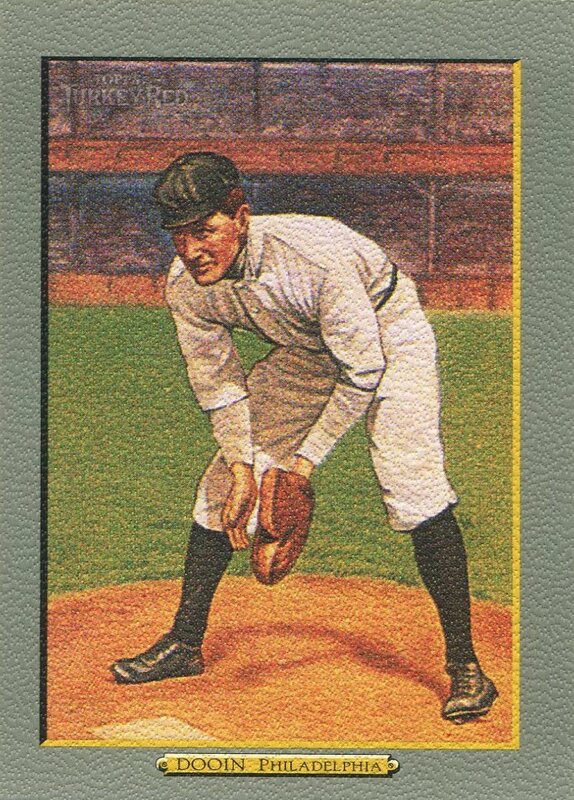 Nowadays, Topps’s retro sets (Heritage, Allen & Ginter & Gypsy Queen) are the only place you can find them employing solely traditional design methods, but even then Topps has to muck the sets up with SPs and parallels out the wazoo. Interestingly, although Topps arguably started the practice of parallels in ’92 and were the only ones to issue a parallel with their base set in ’93, the company didn’t fully embrace parallels the same way their competitors did later in the decade. 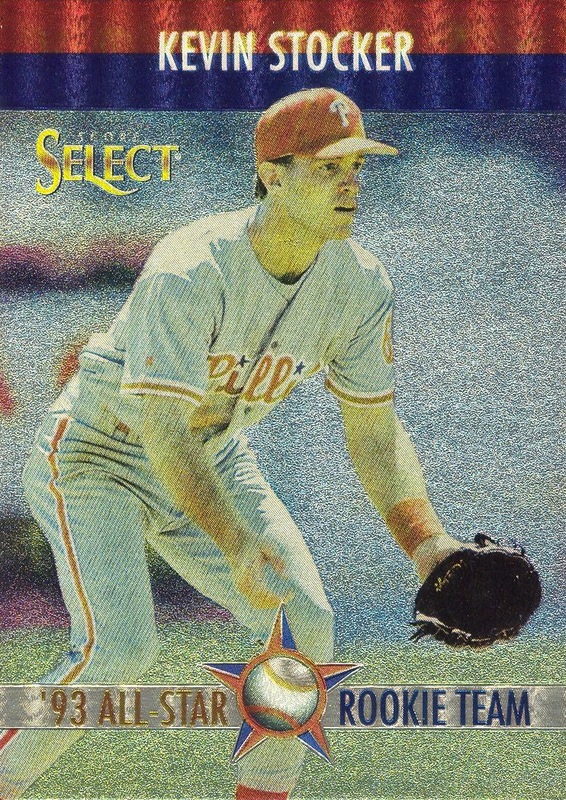 Like Score, Upper Deck used full-color on its backs starting with its debut issue in 1989. However, Upper Deck did very little to differentiate the designs on any its releases during the following three years. That changed with its ’93 release. Although it uses a cursive script on the front and the design elements overlap the picture rather than frame it, the design is still basically traditional — especially when compared to Upper Deck’s follow-up release the following year. Like Topps, Upper Deck would never again issue a set under its flagship line that did not employ some sort of foil stamping or special finish. Although, I will gladly argue that the five-year run of its Collector’s Choice brand, which eschewed the foil on the base cards, starting in 1994 actually continued in a traditional manner the legacy of the original Upper Deck brand — without getting stuck in some in the same design rut. And that’s just the five big flagship sets. In addition to these, as well as the ’93 Bowman and ’93 O-Pee-Chee at the beginning of this post, we had a slew of other sets which eschewed SPs, high-gloss, foil cards, foil stamping, full-bred photography, parallels and all the other bells and whistles that are now considered normal for so many modern issues. Most notably, Pacific debuted that year with a set that looks right in place with all the others sets already covered. 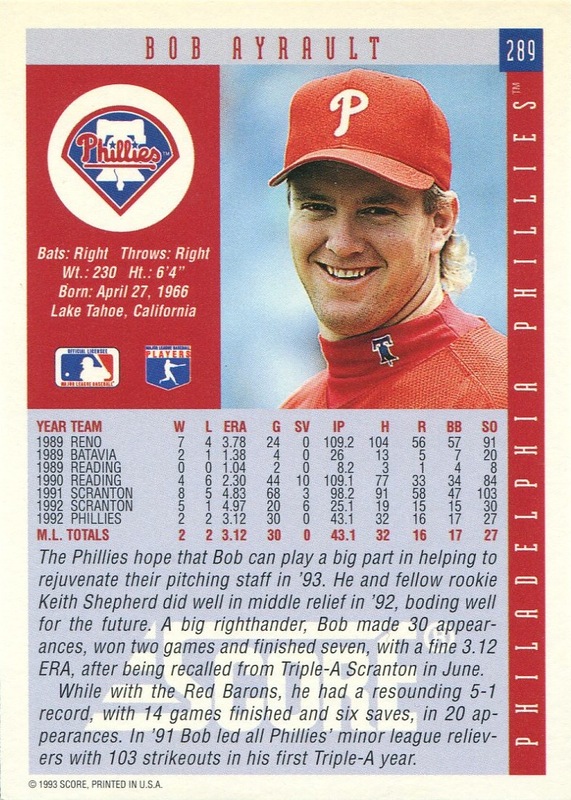 It’s interesting to look back and realize that 1993 marked a real demarcation in the way modern baseball cards are made. We tend to think of iconic sets or the introduction of certain brands as moments where the hobby underwent some sort of shift. There was none of that in ’93. However, what we did see, without anyone realizing it at the time, was one last collective effort to simply produce cards. Yes, there was still a plethora of product and inserts galore, but the sets themselves were much simpler. Looking back at those sets, I realize just how much I miss when cards were issued in the manner demonstrated by the major manufacturers in their flagship brands. Additional Information: Inserted in packs of 1993 Score Select Rookie/Traded. 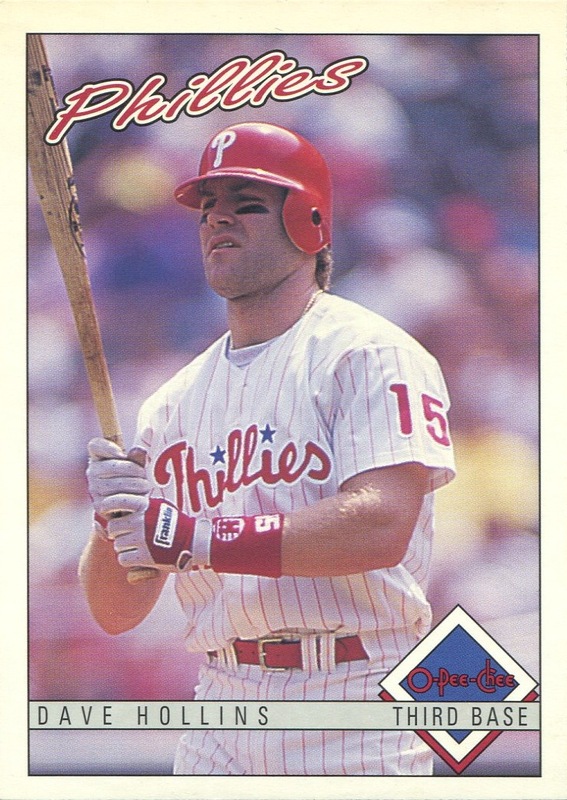 Beckett and SCD both list the set as “1993 Select Rookie/Traded All-Star Rookies.” More information about this card can be found in this 14,000 Phillies post. 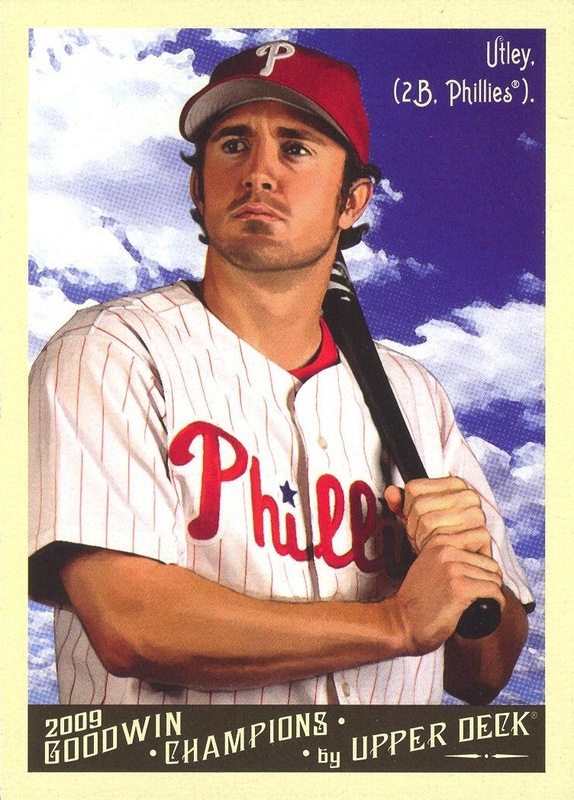 As a Phillies fan, I don’t think I need to get into any real detail concerning yesterday’s news about Chase Utley. All I’m going to say about it is that my biggest fear this past off-season was that the Phillies were an old team and old teams have a very disconcerting track record of succumbing to injuries. Thankfully, the Phillies have a great starting rotation that is capable of carrying a team with a league-average offense. However, having both Utley and Ryan Howard on the DL to start the season means that there is no margin of error. An injury to any of their other starters puts the season on a course that frighteningly parallels the Titanic’s in 1912. 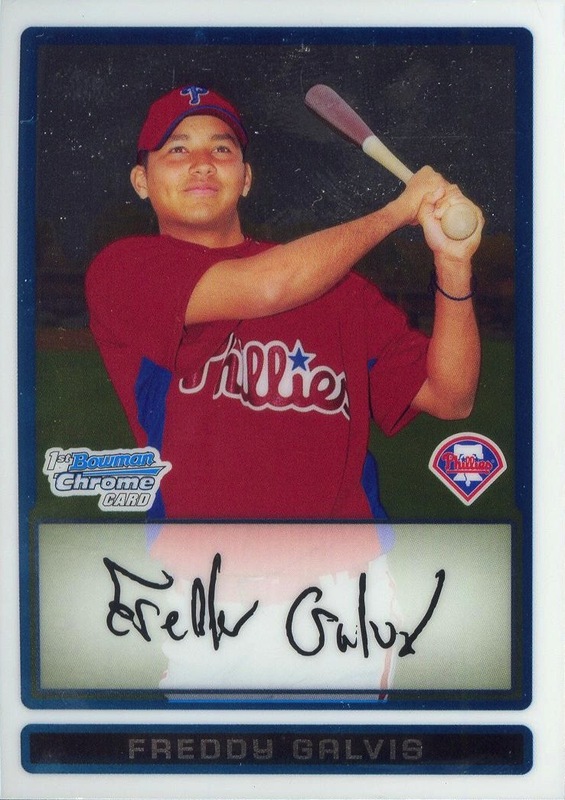 From the perspective of a Phillies collector, the ancillary news that Freddy Galvis will likely start the season as the team’s second basemen means that I am now attempting to acquire his 2008 Bowman Signs of the Future card at what I consider to be a reasonable price. 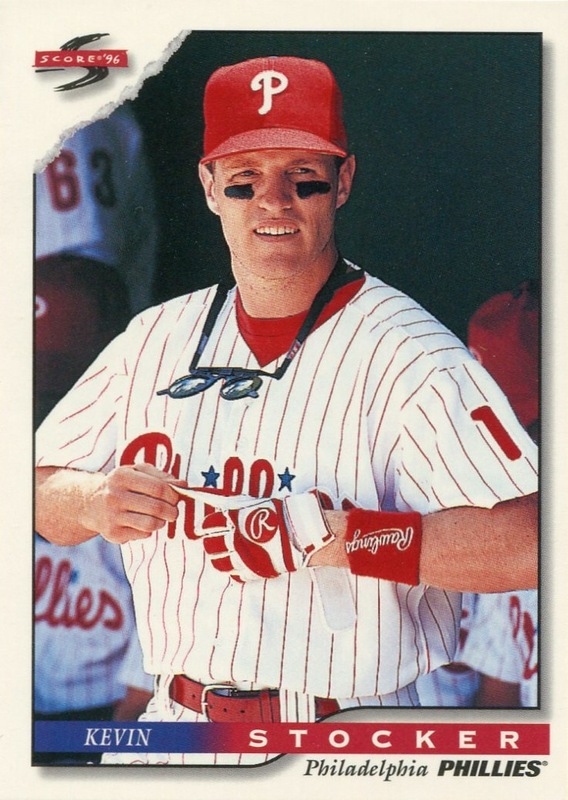 While my policy of refusing to purchase autograph cards of any Phillies prospect until an appearance in a regular-season Major League game seems imminent has saved me lots of money over the past 10 years, situations such as the current one show its one drawback. Back when the card came out, I could’ve easily purchased Galvis’s Signs of the Future for around 10 dollars. Now that I am interested in purchasing one, it looks like eBay sellers are trying to get roughly $50 per card. I don’t expect that to last, and I’ll exert as much patience as necessary. I know that price will not hold, and I hope to have the card in my collection sometime within the next month or so for much less than that. Part of the reason why I can calmly wait is that I’ve had experience with this situation before. 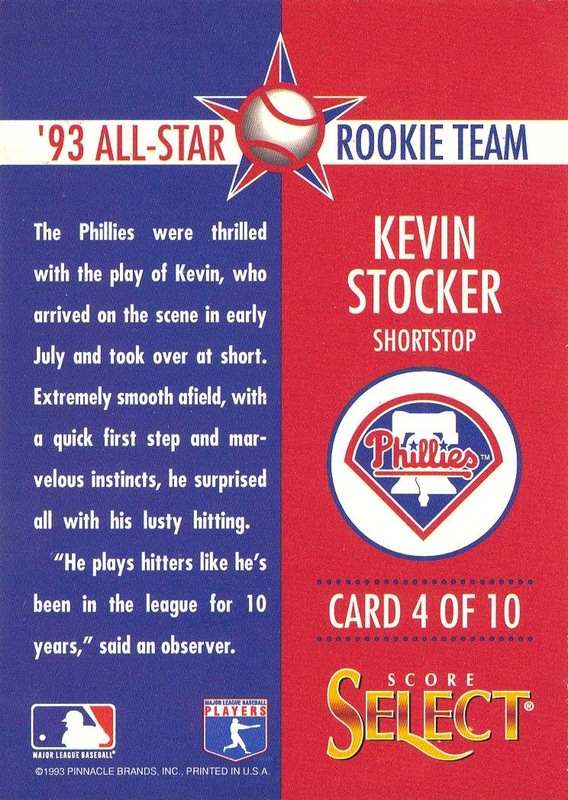 For those of you who didn’t collect Phillies card in 1993, it may be hard to believe that Kevin Stocker’s rookie cards were incredibly hot at the end of that season. 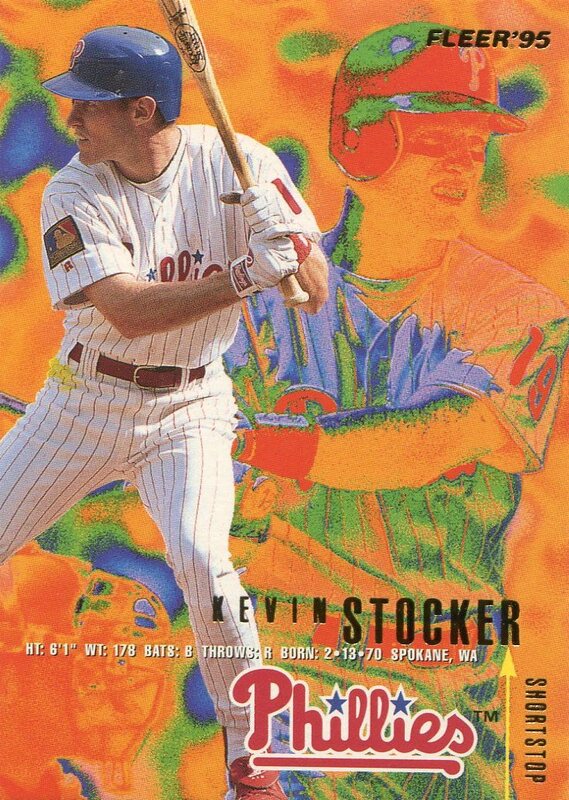 In particular, no card was hotter than the Stocker card you see here. Shortly after it appeared in dealer’s display cases, this insert was booking at around $50 (nearly $80 in today’s cash). 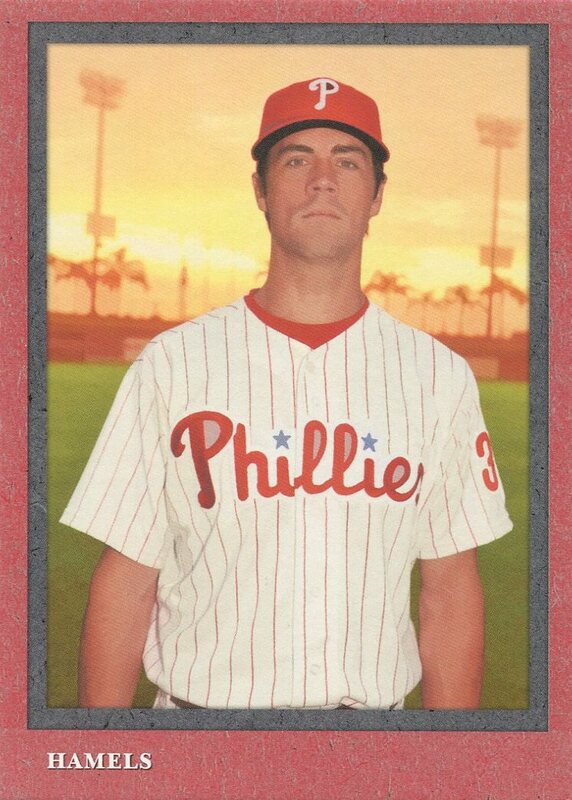 Even though I my desire to maintain as complete a Phillies baseball card collection as possible probably crosses over into the realm of obsessive-compulsive disorder, I never once considered buying the card at anywhere near that price. Luckily for me, a dealer near where I went to high school in Maryland quickly got the card and immediately priced it at full book value. 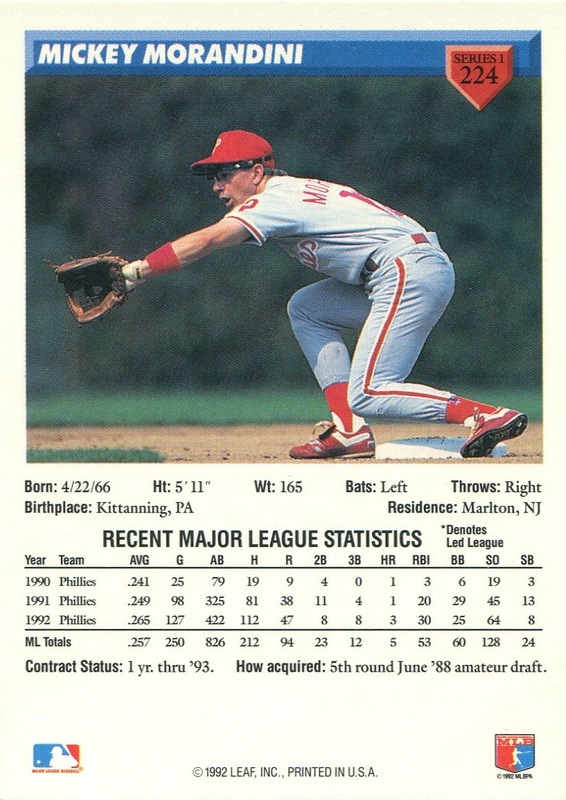 Unfortunately for him, this was pre-Internet and his store wasn’t quite close enough to Philly to properly cash in on the Stocker rookie-craze. It sat in one of his cases for three years (I know this because I checked whenever I came back into town every three months or so) until I finally offered him $10 for it — which I believe was paying double book price at that time. He apparently never bothered to update the price of the card during the three-year interval. After initially trying to get me to pay more, I flatly stated to him that I had waited three years, pointed out what the card was then booking at*, reminded him my offer was double book price, and finally said if he wouldn’t take it, then I would return in three months with a lower offer. Luckily, that brought him to his senses and I walked out of the store feeling like I had a won a major victory, even though I still grossly overpaid for the card. 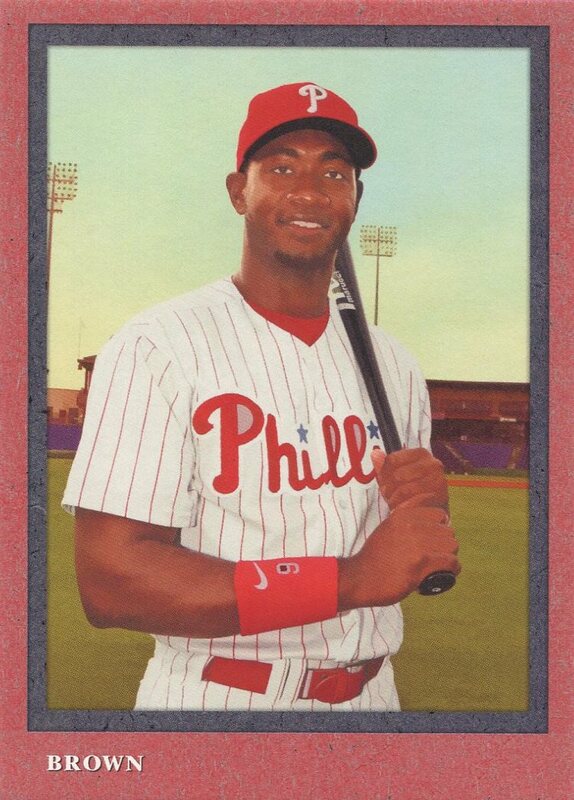 In my mind this Stocker card and the Galvis 2008 Signs of the Future card have a lot in common. 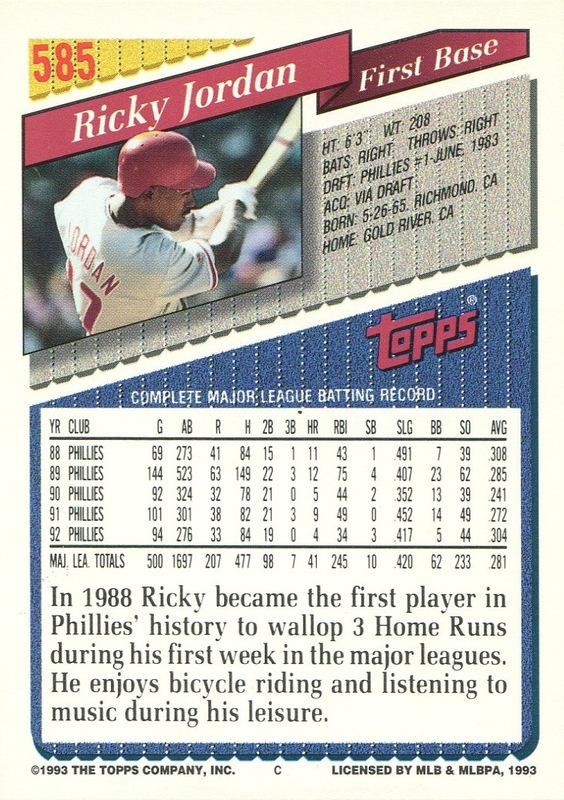 Part of the reason I never bought into the Stocker rookie card hype was that I knew his minor league stats, and there was nothing in them to suggest that he would ever come close to repeating his 1993 Major League numbers. The reason I’m not buying Galvis’s first autograph card is that there is nothing in his minor league numbers to suggest that he will have the type of career that justifies paying $50 for the card. I can be patient. I’ve been in this position before, and I suspect that I’ll be in it again. * The 2011 Standard Catalog of Baseball Cards lists the card at $1.00.